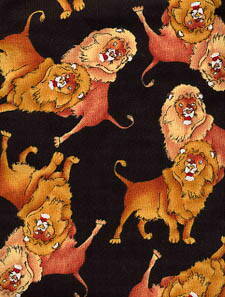 Regular Tarot Bags - Strength Regular Tarot Card Bag - Tarot Bags, Tarot Cards, Cloths, & More! The Lion is often depicted on the Strength card of the major arcana along with a lovely woman who has gained complete control, usually via love and gentleness, of the great animal. Cloaking your special deck in this bag, will provide a constant reminder to you to use compassion and patience while doing your readings. It may also reminder you of your own vitality, courage, energy, control, and fortitude - all traits that will aid the tarot reader as she/he works. Some buyers have selected this bag to house their Tarot of the Animal Lords deck, while others have picked it for their Animal Wise Tarot and Animals Divine Tarot. 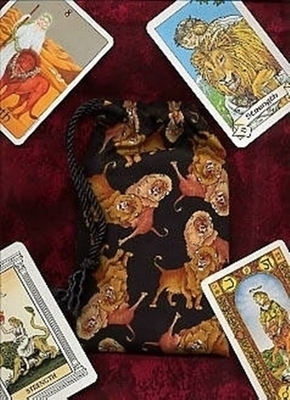 The bag is shown in the picture at right with the Strength card from the following decks: Gill Tarot, Robin Wood Tarot, Alchemical Tarot, and the Tarot of the Golden Stairs. This black, brown, and gold bag would make a comfortable home for almost any tarot deck.